When snowpack in the eastern Sierra runs off into the Truckee River each spring, it hits several reservoirs before winding through Reno and flowing into Pyramid Lake. During the past couple of months, so much snow fell on the Truckee Basin — about 185 percent of normal for this time of the year — that more water will enter the reservoirs than there is space to store it. 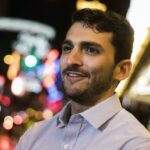 The story is similar throughout Nevada. Across the state, snowpack in all but two basins is above 150 percent of normal. 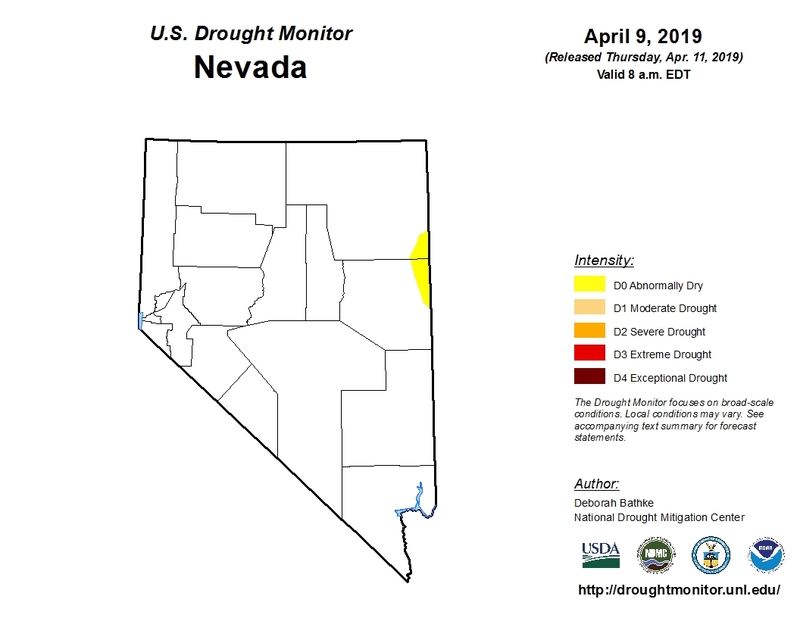 According to a U.S. Drought Monitor update released on Thursday, Nevada is drought free. Only one percent of the state — in Northeastern Nevada — remains abnormally dry. That is a significant turnaround from the start of the year, when moderate to severe drought affected more than 81 percent of the state. “Technically, from this map, there’s no drought in Nevada and California,” said Dan McEvoy, a climate scientist at the Desert Research Institute. Where snowpack-fed rivers run through Nevada, a good water year can boost short-term water supplies. Water managers might aim to store more water in reservoirs or reduce groundwater pumping in an attempt to relieve drought-stricken aquifers. It could also benefit fish, wildlife and wetlands as more water flows through rivers and into lakes. “In a year like this all reservoirs on the Truckee River are not only going to fill but they’re going to spill,” said Bill Hauck, a senior hydrologist with the Truckee Meadows Water Authority. For the Reno-Sparks are, one good water year like 2019 — or the record-breaking year in 2017 — means that the region has a certain supply for three years, even under drought conditions. “You could say Mother Nature hit the water supply reset button,” Hauck added. Still, many warn that one good water year does not erase the long-term management issues facing some rivers and aquifers in Nevada and across the West. In the Rocky Mountain basins that feed the Colorado River — the source for 90 percent of Las Vegas’ water — enough snow dropped this year that an above-average supply of runoff is forecasted to enter the river system. 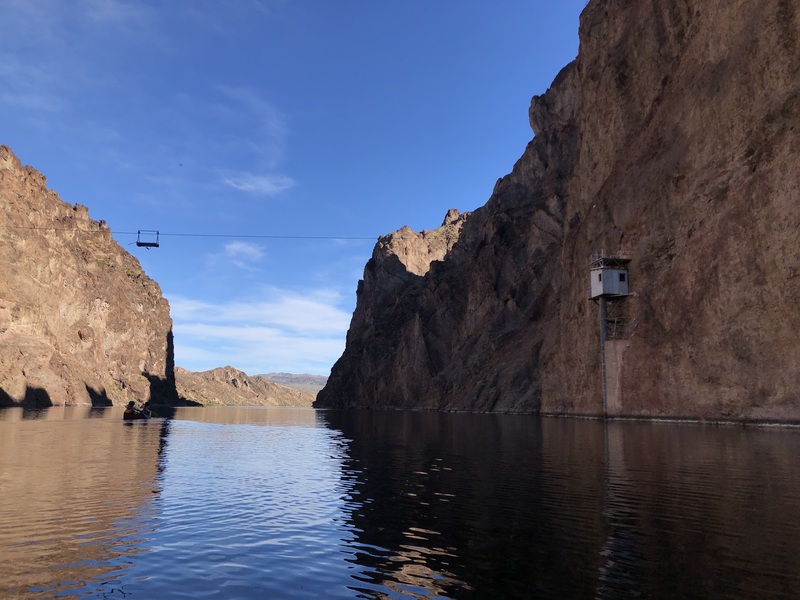 High snowpack has already reduced the risk that federal water managers with the Bureau of Reclamation will declare a shortage on the river next year, according to a March report. But Kim Mitchell and John Berggren, water policy analysts at Western Resource Advocates, said that the above-average snowpack in the Rockies does not erase the problems facing the Colorado River system. The river’s main reservoirs — Lake Mead and Lake Powell — remain below half full. Lake Mead is at about 42 percent and Lake Powell is at about 37 percent. It can be a struggle to communicate that to the public. She also stressed that runoff is often a function of multi-year weather dynamics. For instance, dry soil conditions in Colorado, lingering from the start of the season, could lessen the amount of water that runs off into the reservoirs that line the Colorado River, according to forecasts. In the long-term, research has shown that warming temperatures, or “hot droughts,” can also affect run-off, Mitchell and Berggren said, stressing that snowpack is not the only factor for the river. Berggren added that it’s important for water users to remember that the Colorado River faces structural problems — there are simply more rights to water than there is water in most years. That’s why he said Congress’ approval of a Drought Contingency Plan for the Colorado River was a big deal, even though it was completed in a year when the drought mostly dissipated. The Colorado River is not the only body of water in Nevada that faces structural issues. In Northern Nevada, groundwater pumping along the Humboldt River has decreased supplies, leading to conflicts with irrigators that rely on river water. In 2015, the Pershing County Water Conservation District filed a lawsuit to curtail pumping, as farmers and ranchers were affected by drought. The case is ongoing. At the same time, state regulators have been working on studying how water flows in the basin and developing regulations for managing the river. The snowpack this year does not fix the Humboldt River’s long-term issues, but it will likely help in the short-term. Bennie Hodges, who leads the Pershing County irrigation district, said that a good water year “going to be good for the stuff you don’t see,” such as recharging groundwater. Water managers typically consider April 1 as the date when snowpack peaks. 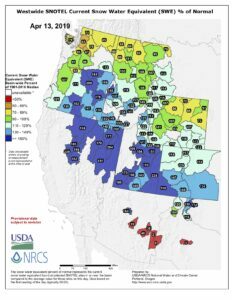 Last year, mountain survey stations across Nevada reported below average snowpack on April 1. The turnaround this year is significant, but not as significant as it was in 2017, when record storms hit the region after a period of dry years, said Jeff Anderson, a water supply specialist who conducts Nevada’s snow survey for the Natural Resources Conservation Service. McEvoy, with the Desert Research Institute, said that it’s hard to draw conclusions about how this year fits into the larger picture of long-term climate, noting that “weather is not climate.” But he also said that recent research on climate change predicts “precipitation whiplash,” where conditions become more extreme, with more swings between very wet and very dry years. “That’s exactly what we saw the last three years,” he said.